I am the host for Made With Love's Scrap This and That Challenge #9. Each month, two members from the Design Team will take turns to host a challenge each at Made With Love. Participants have up to 2 weeks to complete their layouts and upload them to the gallery. Names of winners will be drawn randomly and the winner gets SGD$20 shopping voucher to spend at the store! 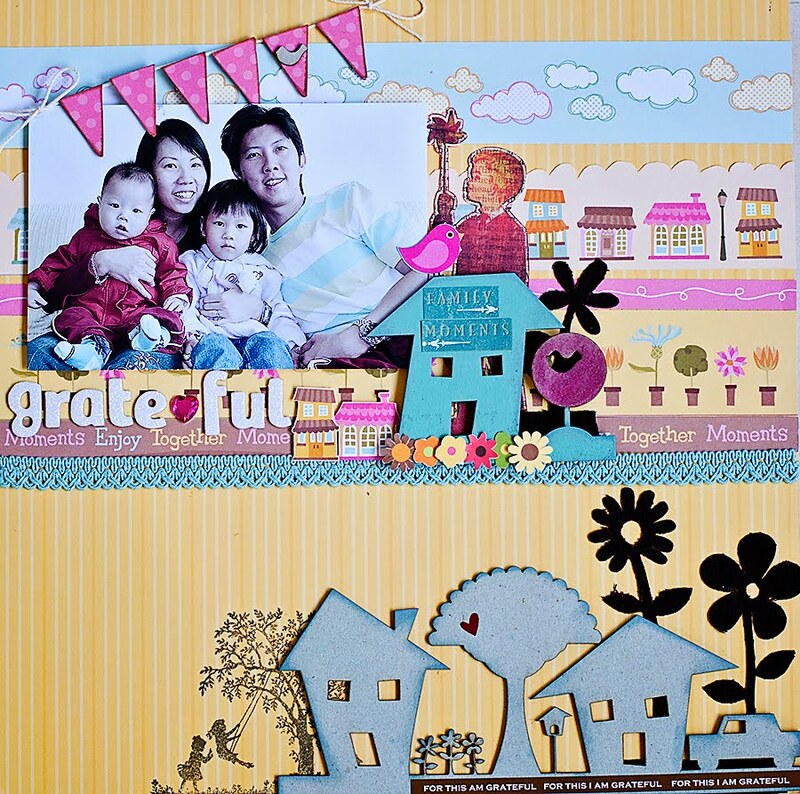 For my challenge this week, it's all about chipboards! Over the years, we have seen various chipboards manufacturers popping up. I used to think chipboards are grey and boring but not anymore! Look at the laser cut chipboards from Dusty Attic, Kaiser Craft, Maya Road etc...So for my challenge, all you have to do is to include at least one chipboard on your layout and 'dress' it up. 1) You can ink the edges like what I did in the layout below for the row of houses (from Buzz n Bloom, an Australian based chipboard company which has closed down). 2) You can paint them like the house at the corner of my photo in the layout. 3) You can cut out papers and paste on them like the string of chipboard banners from Jenni Bowlin that I had used on my layout. 4) You can stitch on them. 5) You can wrap ribbons on them. 6) You can stamp or emboss on them. Well, I have given quite a number of examples already. So come along and play with us on this challenge. Remember, all entries to be uploaded by 19 March 2012, 12 noon.